1. 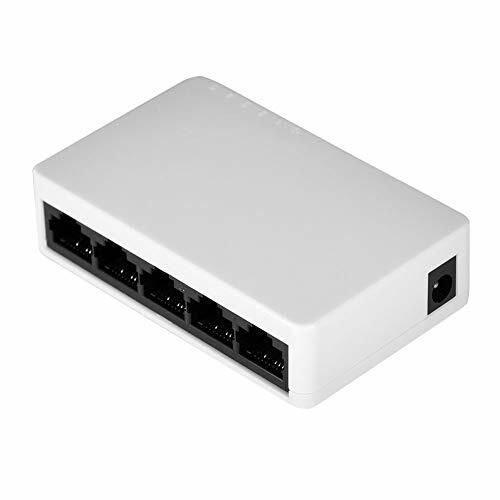 The 5-port switch is used to add more port to your router or network connection. 2. Plug and play. No driver is required. Connect the fibre cat to the IPTV set-top box. 3. Compatible with all network devices, including PC (Win 98 to Win7), laptop, Linux, for Playstation3, media player, blu-ray player, etc. 4. The 5-port 10/100mbps fast Ethernet switch provides 5 10/100mbps adaptive RJ45 port. Improve your network performance to full duplex data transfer. 5. Wire speed switching speed for forwarding packets can be as fast as a network passing packets to them. 6. It is suitable for many kinds of scenes, such as family, campus dormitory and office. 7. When the cable port is insufficient, you can use this switch to extend the cable port and freely share the network. Note: Only a Network Switch, the power adapter or plug is NOT included.